Oh Gracie Girl, I can’t believe it time to write this. You were in and out of our lives way to quickly and your joy will be with us forever. You came to us in January 2005 as young senior, a mere 10 years old. You came to the gardens for a little R & R because you were peeing in your old house and maybe a change would help get you through that. We picked you up and you promptly peed in the back seat of the truck as if to make a statement. But you know what little girl? You met your match because in our minds, there wasn’t a puddle we couldn’t mop up. From that moment forward, we never had another accident. Your little white tootsies loved to dance in the grass. At first you trotted around the acre, then you ran and finally you were flying. I loved your little sideways jumpy hoppy thing you did before you took off. You loved life and were the happiest little girl. Your white-tipped pendulum tail wagged all of the time. When we came home you always greeted us at the door with your standy-up ears, bright eyes and wagging tail. When Karen had to go out of town on business, you patiently waited for me to get the bed ready and promptly took your half out of the middle, leaving me to fend for myself. I never minded for a minute, well maybe in the morning when it took a few minutes to work the kinks out of my body. You were everyone’s friend. You were great with kitties and oh how you loved the puppies at the farm. You welcomed every foster into our home with open paws. Your first momma loved you very much. 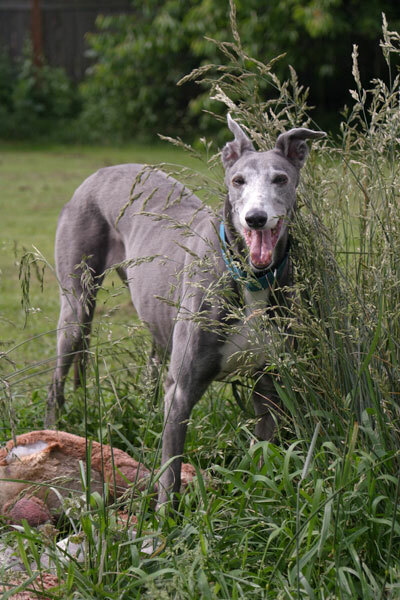 In fact she loved you so much that when she saw how happy you were over here, she let us sign your adoption papers on May 6, 2005 and you became an official Garden Hound. It broke her heart, but she knew you were in good hands and loved. She laughed when you became a charter member of Garden Red Hat Society. Did you know that you are entirely responsible for the perpetual slumber party? When we worried about you going up and down the stairs to our bedroom we moved upstairs to an air mattress in the middle of the floor. Pretty soon all of the hounds joined us every night and now it is an expectation. You were always such a trooper. Anything out of the ordinary and we would scoop you up and off the vets we would go. You were so patient with them. In November when you seemed to have such horrible neck pain you rode for an hour and 15 minutes each way to see the acupuncturist and never complained, not even during the treatments. In hindsight, I suppose the cancer was just beginning to rear its ugly head we just couldn’t see it yet. It was then that I bought my new car, the GUV, a Greyhound Utility Vehicle. We quickly discovered how much you loved to go for rides and it became the Gracie Utility Vehicle. Gracie, I don’t know what I am going to miss the most. You have left such a hole in our hearts. What I do know is that if anyone ever asks me about adopting a senior, I’ll tell them your story. Fourteen months wasn’t nearly long enough to have you. The joy and happiness you left us with will forever stay here. Thank you for the greatest gift. We love you very much.